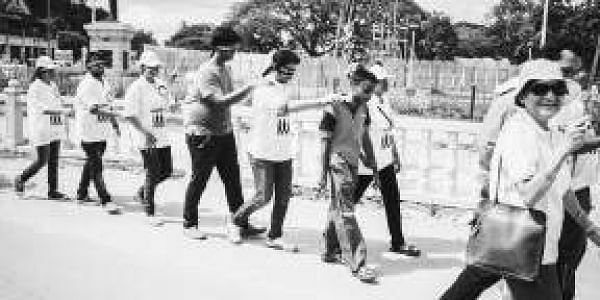 BENGALURU: On October 13, a group of blind persons will build a channel of trust with the sighted and lead them on a blindwalk that will be held at over 55 locations in five countries. The 2016 blindwalk to be held on the occasion of the World Sight Day will see the participation of 5,000 visually challenged people and over 25,000 sighted people. The event is scheduled to happen simultaneously in the United States, Sri Lanka, Nepal, China and India. In the city, the 1km long walk will commence at 3:30 pm from St Johns hospital to Forum mall. Each set of five blindfolded participants will be lead by a blind person with the help of a white cane. Each group will form a human chain, while walking, placing their hands on the one preceding them for the trail that banks on trust, according to Balachandar N, who has participated in the blind walk for about three times now. The concept is to understand what a blind person feels. Balachandra describes the experience as a realisation. "We take too many things for granted and the walk made me realise that. It was awkward at first, but gradually you learn to trust the blind person, who is leading," he says. Suresh T, 29, a visually impaired person who led five volunteers last time says he felt happy guiding people around. The programme ends with a pledge ceremony to donate eyes. The pledge is not a mandatory one. One of the prime goals of the blindwalk is not only to create awareness but also to generate vision ambassadors. The idea of vision ambassadors was propagated in August 2013 when the first blindwalk was conducted in the city with over 600 people walking blindfolded, following the footsteps of a blind person. The Project Vision is a Bengaluru-based NGO, started in 2013 with a mission to give sight to the visually impaired and provide a rehabilitation centre to those who are permanently blind. So far, 60 persons have regained sight through corneal collection conducted by the NGO and has garnered 30,000 people who have pledged their eyes and 2000 have volunteered to be vision ambassadors. Vision ambassadors are regular people who coordinate eye retrieval between the bereaved family and the eye bank after the death of a donor. India is home to one-third of the world blind population and Karnataka's blind population is higher than the national average. The nation requires 1,40,000 corneas every year for 20 per cent of the blind population to be sighted. The 750 eye banks across the country had 53,000 corneas in 2015 which is very less compared to what is needed. "Pledge is only an expression of interest, not a legal commitment and there is no way to track the persons who has pledged. When who has pledged his/her eyes dies, unless their relatives contact the eye bank , nothing really materialises," says Father George Kannanthanam, founder of The Project Vision, who aims to make the city, the eye donation capital of the world. “Most of the time the family of the deceased is so distressed they forget to contact the required number. Cornea can be harvested only within six hours of death. It is the duty of the vision ambassadors to spread this message, ” says Jayant Gandhi, a volunteer of The Project Vision. The walk has been conducted three times since its inception, covering the areas of Jayanagar and Yeshwantpur. The Yeshwantpur blindwalk saw the participation of over 700 people. In Karnataka, the helpline number is 104. and it can be used to reach an eye bank.